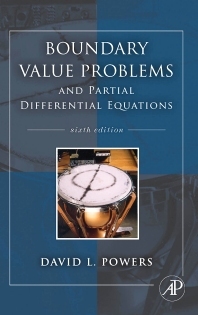 Boundary Value Problems, Sixth Edition, is the leading text on boundary value problems and Fourier series for professionals and students in engineering, science, and mathematics who work with partial differential equations. In this updated edition, author David Powers provides a thorough overview of solving boundary value problems involving partial differential equations by the methods of separation of variables. Additional techniques used include Laplace transform and numerical methods. The book contains nearly 900 exercises ranging in difficulty from basic drills to advanced problem-solving exercises. Professors and students agree that Powers is a master at creating examples and exercises that skillfully illustrate the techniques used to solve science and engineering problems.